Advert containers feature the same markup and appearance as the theme in use! Ad Injector creates another revenue stream for your AppThemes site by injecting adverts directly into listings and search results. 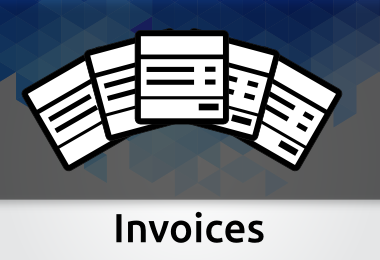 Value for Money – Compatible with ClassiPress, Vantage, JobRoller and Clipper! Custom Post Type – Familiar edit screen for creating adverts. Backup and export/import adverts across sites. Camouflaged Adverts – HTML markup and styling is identical to original listings meaning higher click through rate. 0.1.4 – Fixed bug that allowed for possibility for users to view adverts in admin dashboard. 0.1.3 – Added option to disable ads on front page. Fixed bug which repeated some ads when multiple post types selected. This is a must have plugin if you desire to monetize your site. Multiple options and useability make it a winner! seems I’m again first one who is going for this plugin – unbelieveable – because it is worth each dollar. I need to know if this is possible with this plugin. Here is what I would like to do. I will allow all users to create a listing or event for free. However, when you are on their listing page, I would like to put several Ads there. If they would like to have their listing, Ad free, they will have to may a monthly or yearly fee. Is this possible with this plugin or is this just for the main categories pages that have the list of events or listings? The ads in this plugin are only displayed on the archive pages. You may want to take a look at my Logic Widgets plugin. It can display content conditionally – based on whether user is logged in / listing is from a certain category etc. There is currently no condition for which payment plan a listing (or other post type) is on but I like the idea and will look at adding it for the next release of that plugin. If they would like to have their listing, Ad free, they will have to pay a monthly or yearly fee. Is this possible with this plugin or is this just for the main categories pages that have the list of events or listings? A broken laptop screen last week has set me back a few days with everything. Even so in my timezone your message above was sent just before Midnight on Thursday. I am replying first thing Monday morning. Whilst I want all customers to be happy with their purchases and support received I have other commitments on my time and do not always work weekends. I don’t think waiting one working day for support is unreasonable. I need clarification with regards to compatibility with Clipper Flatter child theme. Is this ad injector plugin compatible with Flatter? Can this plugin be used to insert ad in between the category listing or is it limited only to blog? Do you have option to disable the plug in to make it mobile friendly? The plugin is tested against the core themes it is designed for (ClassiPress, Clipper, JobRoller and Vantage). I have not tested it with ther Flatter child theme but the plugin uses the same markup as the core theme so providing the child theme doesn’t change the markup _should_ work perfectly. I will contact the developer of the Flatter theme and arrange testing it for you. 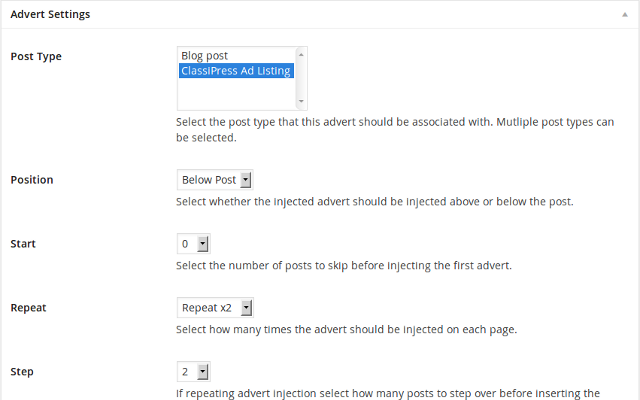 The plugin inserts ads on archive and search result pages for all standard theme post types – for Vantage this is posts, listings and events, for ClassiPress is is ad listings, posts etc. Whether you needed to hide injected ads would depend on what content you put in them. A simple CSS media query could hide ads for certain screen sizes though. Happy to help with this. Thanks Matt… I will wait for the test response…. Add the above to you style.css file and you’re good to go. Any problems let me know though and I’d be happy to help. I’m also using the Flatter theme, and I just purchased your plugin. Do you know what CSS I would need to add to get AdSense responsive ads working? I have opened a thread on the support forum for you. Hello, I wonder if this plugin works jobroller? its look like there is no support for this plugin on the Forum and there is a better reponse here, so I post it here. after I have place my first ads banner, it doesn’t show up on my website. Can you please tell me what file do I have to edit to add what line of code ? You are saying in the installation maybe its need some fixe to css layout on some Child theme. But it look like some theme its just doesnt work. The plugin has been designed for and tested against the core themes. It should work with child themes (providing the child theme does not change the markup for listings) but has not been tested against them. I will contact the author of Simply Responsive and arrange to test against the theme for you. Hi @maximej, I can confirm this plugin works with the Simply Responsive child theme. Straight out of the box. I have implemented it in the demo without problems, see for yourself. However, I did notice a slight ad count problem, not from the plugin, but because I had an extra class that is unique to my theme, but Matt and I slotted that into the pluign in no time. This is a great plugin to have in your arsenal. Simply install it and away you go. Good work Matt and good luck with your sales. its work perfectly now, Thanks to Matt for the great support. The problem I have was from another plugin ‘Feature Ads Animation ‘ from Classipro . When I have deactivate this plugin, everythings was working fine. There is another plugin that work good now. I think the owner of ”Feature Ads Animation” need to update his plugin. Is this working on the Flatron childtheme of Spartac? It *should* work find straight out of the box. If the child theme changes some of the markup and it doesn’t, as was the case with the Simply Responsive theme, it shouldn’t be an issue tweaking to fix. If you want to PM me I’m happy to send you a copy of the plugin to try with the theme before you buy. It is tested locally on my machine with the latest build of WP and the latest dev version of CP. I have got your plugin and it works fine, but I only have a question. On a few sites I use flatron and only show the grid layout on these sites and there it does not work quit so good when you say after 2 ads and lets say 3 steps, it shows of course empty ad spots as the sizes of these ads are different then the regular ones who are below each other, you have any idear how I can make it show a normal ad from 468×60 below a row in the grid layout? I want to buy this plugin. 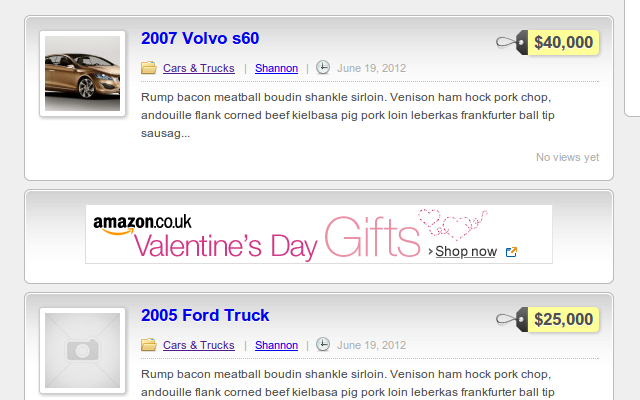 However, I would like to see an example on how a Google AdSense add will look inside a Vantage listing. Not the archive. Just an actual directory listing. 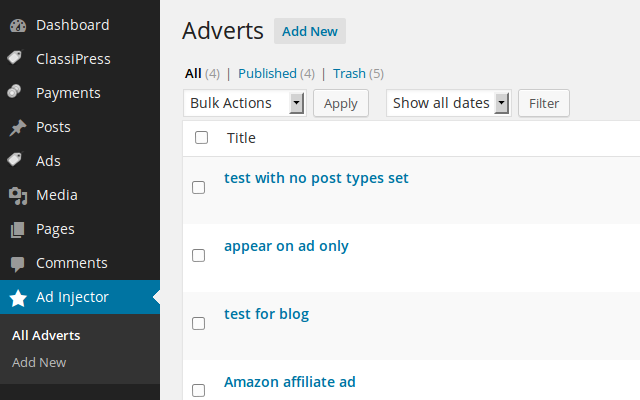 The plugin injects ad’s into archives and search results. It doesn’t display adverts on individual listing pages (or the single template of any post type). 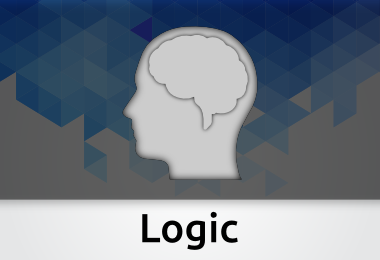 Have you seen the Logic Widgets plugin, that may be more suited to what you are after. If you use adsense, it will only inject one single ad, repetition does not work with google adsense. And it does not handle shortcodes, so if you use that in your ads the shortcode is written as text not converted to html. Do you think you could make this work with the Home Control plugin on here? The problem at the moment is the ads show up on the homepage when you use the grid view option in their plugin and it just looks a bit odd. I mean, I’ve got 468 size ads in the archive pages, but they show up in the grid view on the homepage too when I use both plugins together and it just doesn’t look right. Also, how do I get the ads to be responsive? I’ve tried setting the width to nothing and to 100% (which is how I usually do it, and it seems to work) but because I’m adding the code for the 468 banners through the editor it seems to add the width automatically and I’m not sure how to fix that. It throws everything right out on a mobile. Is this plugin still being supported? The reason I ask is because my previous question has gone unanswered for 12 days. Thanks! Apologies for the delay in replying – for some reason I don’t always get notifications of comments on marketplace items. If you can use the support forum I’ll get email notifications of threads/replies there. Home Control – I’m not familiar with the plugin. Please PM me and I can try and arrange testing both together. Responsiveness – please send me a PM with your site address and I’ll take a look. Sorry for the delay in replying to this. Like you, I didn’t receive a notification so didn’t know you’d replied. Hi Paul, I have responded to you PM. Matt. I have Vantage and the Child “Directory theme. Not decided on which yet? Basic. Is Add Stuffer also compatible ? With the other two. What is compatible with “Directory” ? My ability to keep track of what seems compatible dead ends at the Basic themes. Just keeping the possibilities related or not, to prevent overlap and un necessary purchases detracts from the entire process of putting the parts together. Thats two questions and a customer review of some confusion generated. Both Ad Injector and Logic Widgets should work fine with but it depends on whether/how much the markup is changed by the child theme. Ad Stuffer is not my plugin so I cannot comment on compatibility. Please send me a PM with your email address though and I will sort out you being able to test my plugins before purchasing. Is there a way to incorporate featured ads into this?. I just wanted to thank you for this great plugin. It’s exactly what I’m looking for. Seems like there are a lot of unappreciative people here that don’t realize what goes into to development and support for custom work like this. And you are offering it at a great price! Anyhow, thanks again! Keep up the great work. I bought this plugin and for the world achieving display on the control panel WP, I only see the plugins in the list of plugins installed but do not see where to run, I tried to visit the site of the creator of plugins and page this off . Been a while so just hoping someone still reading here. I’m a newbie so will just try to explain what I want and you can tell me if that plugin is what I need. I want my landing page (ad listings) on Classipress to have widget area between listings. As I only intend to use that for custom ads, like banners I don’t care about other widget functions. Is that the plugin which can do it for me without coding? What control do I have over it? Do I get to customize each and every single position seperately to have let’s say 10 different ones on the page? I had banners galore but that thing displayed exactly same thing through the page. Hi i just bought this and am trying to use it with Vantage and it doesnt work. It only every shows 1 ad max even if i do multiple adverts or 1 with repition nothing works. Please help me fix this or I will request a refund. 1. Would this plugin work with the Grid Layout used in the Home Control plugin? 2. And would it work with the listing page or do I need to add code in specific area of listing page for this plugin to work? I like to see a demo with Vantage theme, Can you please send me a link. Is this plugin still supported? I see that there hasn’t been any comments in a long time. Can someone direct me to a site that is using it? Nevermind… if it’s not for sale? Why not take it away?